Infinity Time Capsule: Your chance at immortality. 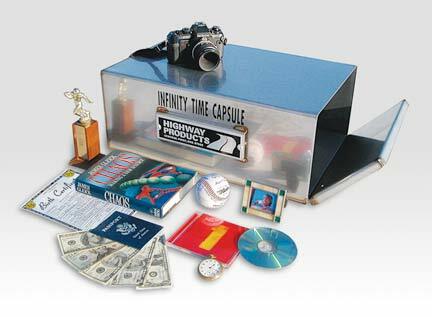 The Infinity™ Time Capsule by Highway Products, Inc. Your chance at immortality—send your photos, memorabilia, valuables and prized documents into the future. Think of sending part of yourself, your family, city, school, or church 50,100, or 500 years into the future. What would you want your grandchildren to have of yours in the year 2999? What advise would you give them? The Infinity™ Time Capsule is made of acid-resistant stainless steel, purged with dry argon gas and welded shut—to be opened professionally on a designated future date. The special grade of stainless steel, combined with the unique processing ensures the contents, especially paper documents, will not turn to dust, ever. Why the Infinity™ Time Capsule? 1# The Infinity™ Time Capsule is made of hi-grade 304 acid-resistant, non rusting, stainless steel. The same material used by chemical, cryogenic, food, dairy and pharmaceutical industries. It will virtually last forever. 2# The Infinity™ Time Capsule is purged with dry Argon gas before welding shut. Argon gas is inert, meaning in chemistry, having little or no ability to react, which prevents acid reactions, the biggest enemy of time capsules. It's the same gas used to preserve "The Declaration of Independence". 3# Oxidation is another major threat to items stored for long periods of time. By replacing the oxygen with Argon, oxidation is eliminated in an Infinity™ Time Capsule. 4# Unique Processing Method. Welding stainless steel is a science and an art. It must be an air-tight seal and our certified welders must keep the heat from damaging the contents. We have mastered this technique and are also able to purge the Infinity™ Time Capsule with Argon at the same time. This special grade of stainless steel, combined with Argon and our unique processing ensures the contents will not be effected. 5# The contents of a time capsule can be more dangerous than the elements that surround it. Insects, microscopic organisms such as fungus and bacteria, can sneak in and after a while get hungry. Guess what they have to eat? Our Argon gas process replaces the oxygen which does not allow anything to live. 6# Blocks harmful rays of sunlight. 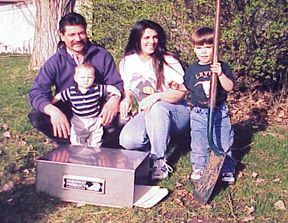 Many people putting together a time capsule don't burry them. They might put them on the mantle or display somewhere. The sun is one of the most destructive forces we have on this planet. Even faint or reflected ultraviolet rays will deteriorate ink, paint, cloth, wood, paper, etc. The Infinity™ Time Capsule is totally blacked out and sealed with no place for the sun's rays to sneak in to do damage. 7# Need a special Size? Our Infinity™ Time Capsule standard size is 14" wide x 10" high x 17" long. Plenty big enough to put large envelopes and even a pair of granddaddy's old shoes. Or we can build one just for you, any size you want. Just mention the word "Time Capsule" and heads start turning. Why? Because people want to be remembered. Using one of our Infinity™ Time Capsules as the draw or attention getter, ask for donations towards your project and in return, give your donors a place to put their special items, documents, etc. to be opened in 60 years and given to their grandchildren. A $10 donation gives them a small envelope, $50 donation gives them a large envelope. $100 gives them a large envelope and a small item no bigger than a baseball, $1000 gives them a shoe box.. Depending on the amount of money you're trying to raise and the audience you have to work with. You can start with any amount you want. Once you have the items to be sealed, we can then build you the size of Infinity™ Time Capsule you need. We can also send you an Infinity™ Time Capsule to display at a donor party or event. If you put a team together with a little thought you could raise a lot of money. Call or email us for suggestions. Call 1 800 866 5269. Once you get your Infinity time capsule, bury it somewhere nice and make a big deal over it. You could also ask for donations to cover the burial cost and a plaque to mark it. This can be fun for everyone and they will talk about it for years to come. Plus, you will be adding something special to your community. Churches, schools, fundraiser's, and charitable organizations. We have gift certificates to help you with cost. Call and ask for one. What's The Next Step? Call our Sales Department. They will answer your questions and give you the details you need to start the fun! You will be sent a special container for insertion of the items to be preserved. When filled and returned to Highway Products, Inc. Infinity™ Time Capsule department, a notary documents its insertion into the stainless steel box. An engraved brass plaque with the originator's name, the date of the seal, the designated opening date and opening instructions is riveted to the time capsule. The capsule is then purged with Argon, welded shut and returned to the user for safekeeping or burial. A lot of time capsules have been lost over the years. We recommend you register your Infinity™ Time Capsule with the "International Time Capsule Society", located at Oglethorpe University in Atlanta, Georgia to make sure you get found where and when you want to be found.. It's free and will make sure your time capsule is found when the time comes. Our Sales Staff are ready to help you.